It’s time for the next installment in the Star Wars series. It’s still the most popular Sci-Fi franchise out there and it’s pretty surreal that the series finally got to keep going after the long gap since episode III. This one’s been getting fairly mixed reception and it’s easy to see why. I have a lot of mixed thoughts on it as well. There’s a fairly large laundry list of pros and cons that I have with the film that all get thrown together which is why this review will be fairly long. Long story short, it’s a good movie, but one that feels like it’s considerably longer than it should be with not much actually happening for most of it. The film starts with the Republic getting wrecked on all sides by the First Order as per usual. They’re outgunned and outnumbered but they have spirit. Against orders Poe decides to take down one of the enemy flagships and single handily saves a good chunk of the fleet. For his bravery he is demoted. Unfortunately the First Order is still gaining on the heroes and their only chance is that Rey will return with Luke Skywalker to save the day. In case she fails at this task, Finn is charged with a backup plan to find someone who can help them disable the tracker that is preventing them from escaping. With two plans in the works surely one of them will succeed right? Or is all hope lost already? It’s great to see the opening credits roll and the classic Star Wars previously segment play. It’s always been a nice staple in the franchise and it works well. It also allows the film to go forward without having to show everything by giving us a little info from the start. As a result, the actual movie starts out with the big fight in space and that’s exactly how you should start a Star Wars fight. While the Lightsabers may be the most popular aspect of the series, the title would suggest big galactic battles like this one. It’s handled really well and you feel bad for the Republic since their ships are always so outnumbered. I’m a little skeptical on Poe’s ship massacring the big Star Destroyer but I always did say that I’ll take speed over power any day so I guess this proves my point. He did a lot of damage there. It’s a very strong start to the film and it hits all of the beats that it should. Unfortunately things start to slow down here. Lets stick to one chunk of the film at a time though. There are 3 main plots so in those plots I’ll discuss the relevant characters as well as positives and negatives. The first plot is the Poe plot. The heroes are on the run and they need a plan. Leia gets knocked out because she made the mistake of being in the command room with all of the other generals. However, it is the only unguarded part of the ship and this is such a big design flaw that the people who built the Death Star can now breathe a little easier. This leads to a rather random scene. I won’t go into detail, but I didn’t care for the scene simply because it leads into absolutely nothing. It doesn’t help that I really don’t like Leia. She’s become such a bad character ever since she went into power. It’s like all good characters are corrupted by their bureaucratic status. Just look at how Naruto fell once he turned into Boruto’s father. Now, I can’t blast this scene too much though since obviously the plans had to change when the actress passed away. This plot point could have very well led on to something if she had stayed alive or perhaps she was supposed to die but to let the actress go out on a happier note they spared her. Leia’s replacement is even worse though. While Leia makes consistent bad choices and shows no leadership qualities, at least she tries. Her replacement refuses to share her plans with anyone and is constantly aggressive for no reason. She seems to be very self conscious about what a bad leader she is so she takes it on everyone else. I don’t remember her name and I don’t even care enough to look it up. She has purple hair and you’ll know her when you see her. She has some of the worst plans that I’ve ever seen a “competent” general come up with. By “competent” I mean that the film wants you to think she is a brilliant strategist and that she knows what she is doing. It’s one thing for a comic relief character to come up with a bad plan or for someone that the film is trying to make look bad to come up with a bad plan. This is something altogether different because it is portrayed as a good plan. Without going into specifics, the new commander wants to sacrifice 100% of the fleet and get everyone to escape in small escape pods that have no barriers or weapons. Except for massive plot armor this is a complete suicide strategy with no hope of success. How would the villains not notice these pods on their scanners? This is the future right? In the present you are able to see small objects on a scanner, I refuse to believe that they simply wouldn’t notice them. Even once the plan starts tanking nothing is done for a very long time and then the lady remembers that she has one last option. By then almost everyone is dead, but still she is supposed to be remembered as a hero. Forget that! The true MVP of this plot was definitely Poe. So much so that I can safely say that he is easily the best character in the whole film. He is always the one making the right decisions. It may have been risky to take down the Destroyer, but he saved a lot of lives in the process as it would have meant trouble for the other planets. It’s the other pilots who should have done a better job of steering and not dying so easily. Poe’s plan is much sturdier than the commander’s as it is at least a plan that has a chance of saving everyone else. Just giving up is the worst possible call to make in any situation. I’m also glad that Poe has a lot of loyal allies by his side since it shows that the crew can think for themselves. Getting sucker blasted by Leia was annoying, but not something I would blame on Poe. It’s just another reason not to like Leia. Hopefully Poe gets another big role in the next film since his character is really going strong now. This plot was probably in the middle of the 3 for me. It wasn’t as slow paced as the other two, but at the same time it did stall the most. When you think about it, that whole plot is basically just the main ship running and the enemies blasting at it. It’s stuck for so long that it almost feels like they’re using stock footage at times. There’s one moment in particular where the camera keeps cycling between the 3 plots and it lands on this one twice where I saw 2 ships getting blown up each time. They were probably different ships, but it really looked like the same scene. Next up is the weakest plot in the film. It belongs to Finn and his new partner, a fan of the pros. You can tell that she’s going to be annoying from her first scene as she gives Finn a sob story and is way too in awe of him. I’ve never liked the hero worship trope in fiction or the fact that it’s a real thing in life. (Shoutout to the Smash community) While her backstory is tragic and all, you have to wonder why she is in the film. Her romance with Finn is awful at best and while she makes the right call in stopping him during a critical moment, it’s also just super annoying. I was annoyed with her the entire time and that probably hurt the plot as a whole. Finn wasn’t much better though. He was seriously going to just run away. I was waiting for the twist or for him to explain that he wasn’t actually doing that…but he was seriously going to just up and run away. You can immediately see the contrast between him and Poe. Both agreed that the commander couldn’t lead her way out of a barn, but Poe decided to stay and do something about it while Finn decided to run away. Case Closed. Finn’s just not a fun guy. Even when they go to the casino and hundreds of lives are hanging in the balance..he stops to enjoy the atmosphere and the games? You’ve got to be kidding me! It’s hard to even root for him against Captain Phasma since she always gets the shaft in these films. Why is she not able to beat Finn in a one on one fight? She’s also not experienced enough to know that turning your back to the enemy and having slower reflexes than a turtle is a bad combination. I can’t say I’m really a fan of Phasma either, but I’m convinced that the writers just don’t like her. She is intentionally treated as a joke. Finn is unintentionally treated as a joke and there’s a big difference between those two. The former can be good writing while the latter is tragic. Finn is maybe slightly better here than in the first film…maybe. In some ways you can say that he has regressed as a character. If it’s not obvious why this plot is the weakest, it’s because there are no good character here. They break out a quirky locksmith guy, but as he’s drunk the whole time it’s not like he’s going to be much of an improvement to the cast right? He doesn’t appear for very long anyway and I have to question just how weak the imperial defenses are if some guy in jail can pick them. Shouldn’t they keep upgrading their tech at this point? The plot is easily the least relevant to the film as well and probably could have been cut with nothing actually changing. As it’s the backup plan it could have easily been wrapped up a lot sooner or just been left to the way side and the Rey plot could have changed a bit to accomodate it. Of course, that’s the big plot. We’re finally up to Rey and her adventures with one of the worst developed characters in history the biggest traitor since Benedict Arnold the mass murderer through negligence Luke Skywalker. I can’t begin to tell you how much I can’t stand this character. It’s hard to hear the guy talk since Luke is so obnoxious. Luke is not only a traitor and mass murderer, but in general a very egotistical, arrogant guy who can’t back up any of his tough talk. He went from being a standard main character for 3 films to someone who has turned his back on the heroes and doesn’t mind if they’re all slaughtered. I’m still puzzled as to who on Earth thought it would be a good idea for him to be such a heel here. The trailer set off all of my warning bells back in the day and the film solidified them. They may as well have turned him into a Sith Lord considering what happened here. When he first rebukes Rey and tells her that what she said was wrong you want to slap him since it was a valid answer. Luke’s answer is the one that’s hogwash as he tries to tell her that the Force is just energy everywhere and all that. It’s his catchphrase as well so you’ll hear him say it again, but he’s annoying (and wrong I’d say) both times. Rey didn’t say anything that really contradicted him and lifting things is basically the Force’s greatest strength. The Force wouldn’t be nearly as good without telekinesis since you could be shot from behind without it or lose in a fight. Controlling weak minds is okay and all but it only works on the weak. You need to keep your barriers up at all times or you’re through. What they did to Luke is just plain insulting to the original trilogy. His character has been completely warped and I can see why fans would want to pretend that this film just never happened. I still say it’s depressing that after Episode VI where we finally beat the Dark Order and the Republic got to be in control, that everything was thrown back into the status quo off screen. It’s just hard to picture and also makes the first three films entirely pointless. Take them away and now nothing has changed. I went into that a lot with Episode VII so no need to tread old ground. Rey is still a solid main character. I liked her a lot in the last episode as she was a pretty selfless hero who wrecked Kylo Ren and used the Force pretty well. She’s a slightly weaker character here as she lets Luke and Kylo take control quite a lot. I’d like to see her ordering them around or at least holding her own a little more. Perhaps in the next film though as she is steadily growing stronger. She is still a great character regardless and I’d put her as the second best named character. She may believe in Kylo Ren’s chance at turning over a new leaf too much but that’s not something I can fault her for. I still can’t take Kylo Ren seriously. When your first scene is getting mocked by the main villain and throwing a temper tantrum in an elevator, you’re just not the kind of villain who is ever going to command respect. His conversations with Rey also don’t help the mystique angle as he just seems like someone who is being led around by forces he cannot comprehend. Kylo Ren can fight of course, but I’d still say that Rey should be able to beat him and so he shouldn’t be much of a threat to any of the higher fighters. The Red Agents should have obliterated him. I’ve always liked the Red Guards. Those guys have awesome designs and have been a big part of the Star Wars background for a long time. How they didn’t defeat Rey and Kylo I’ll never know. I can understand Rey beating them, but Kylo? He should have gotten wrecked the instant the fight started and yet they acted as if he may be a little stronger than Rey now. I dunno about that, but I was really satisfied wit the fight scene. It’s easily the highlight of the movie. I’ve been waiting for a modern day Lightsaber fight for so long. It’s not quite as solid as the fights from the prequels yet, but we’re getting there. I imagine it’ll take time to get the choreography quite up to that level, but by the next film they should have it down. While Star Wars may not revolve around the Lightsabers, I think it should. That’s why I’ve always been a fan of the franchise and that’s why I like the prequel era so much. The Jedi vs Sith wars were a blast and nowadays you only really get to see that in the video games. If this is any indication of what will happen in Episode IX, then I’m all set for that. Emperor Snook is pretty disappointing though. He doesn’t get to fight and is heavily nerfed so Kylo won’t look too bad. The character had a lot of potential so it was rather disappointing to see him go out this way. He has to lose at some point so I wouldn’t mind a Rey and Kylo team up against him, but at least some kind of fight. He’s a Sith Lord! The guy should be crazy strong. At least he has some hype though. The only other villain left is Hux and he’s effectively comic relief. The film did a good job of making him look part monkey to an extent though, bravo! This plot was the best thanks to the fight scene. The Luke and Rey scenes were fairly dull though and the characters didn’t really do anything for a while. She’d ask him some questions, he’d ignore her. Rinse and repeat for roughly an hour. Rey did go into a cave, but nothing actually happened there so it was basically filler. Luke spent the whole subplot embarrassing himself as well so the longer it went on the worse it got for him. Even the flashback with Kylo makes him look terrible. He looks painfully weak and I’ll never be able to take him seriously again since this was allegedly Luke at his prime. Luke should blame himself for what happened since it really was his fault, at least when you look at the scene that’s the impression I got. He should have done a much better job of leading. Luke gets so bad that even the Sith complement him on making their job easier. I almost thought his final scenes had some plot hax, but the film handled it well so I have no complaints there. The plots all merge by the end so for Episode IX we should finally have the full cast assembled. It’ll be nice to see the characters think up a battle plan as a team for a change. That being said, the war seems like it’s pretty much over. There basically aren’t enough people still alive to form a resistance since everyone was murdered so they’re going to need to just rely on Rey. She can take on an army on her own so the others should just sit tight and try to learn how to be Jedi in the meantime. Otherwise, it’s hard to see how they will really be able to contribute, but with the timeskip maybe the rest of the planets will send more cannon fodder to the heroes to beef up their ranks. You can’t help but feel bad for those guys, but they knew what they were signing up for. So where does this rank in the Star Wars films? Well, I’d consider Episode IV, VII, III, and Rogue One to be the 4 strongest by far and in that order. Next up I’d place this one followed up Episode V, VI, and I. Episode II is all the way below and I doubt/hope a Star Wars film never reaches that low again. So at 5th place out of 9 that’s not bad at all. I fully expect the next Star Wars film to beat this one, but I guess we’ll see what effect bringing back the old writer will have. I do wonder just how much the writers like to mess with the script and what the last writer did to their benefit. After all, only the writers and executives are likely going to know how the film was “supposed” to go so we can only speculate. Whatever happens, I just want a lot of action so deliver that without falling into any landmines and I should be good. Pull another Luke Skywalker twist and that will just be sad. I think it’s safe to say that big Star Wars fans will appreciate this title a lot more than a typical action fan. There are likely a ton of cameos and references thrown for these guys. I picked up on some, but for others I have no idea. As the plot doesn’t move too much, you’re supposed to get hyped over each character and what they’re doing. Since I didn’t like half of the characters I was supposed to like it didn’t work as well on me as it was supposed to. That shouldn’t be a big problem if you’re super into the franchise. After all, it’s not like I gave most of the films positive scores. That being said, if you’re especially a big fan of the original trilogy then there’s the chance that the opposite will be true and you’ll see this one as insulting its legacy. The only way to find out is to watch the film. While the camera work is good for scenes like the Red Room where it’s very atmospheric, I’m not sure about the directing for the characters. It may not be the director, but I’m not sure who’s in charge of this. All of the characters seem to be out of breath all the time. It’s borderline distracting and this was an issue in Episode VII as well. Just think back to the first trailer for that one where the cliffhanger every time was Finn really out of breath trying to get up. (Always thought that was a weak scene btw) That happens here to basically everyone. It’s like the director tells them to all go for a job right before filming each scene. I just don’t get it and it’s a problem that I only really notice for Star Wars. The film also really overdoes the close ups on each character. We don’t need to see their faces in such intense detail to understand that the scene is intense. A standard far shot will suffice. The movie uses a lot of the classic themes from the old films. They still sound as good as they ever did, but the movie still seems to be relying on nostalgia here as opposed to coming up with new tracks. I can’t recall any new tracks that were memorable or epic during the scenes. I only remember the iconic themes that play during the movie. Still, they’re enough for me to consider the film to have a pretty solid soundtrack. The visuals are pretty nice as well. The space fights are epic and the lightsabers are solid as well. Now all we need is a city like New York and we’ll really be all set! The writing is quite solid. Ignoring the talking animals and robots who use grunts to say nothing while sounding deep, the humans all seem pretty good. There’s not a lot of random language at all and in general I don’t remember characters swearing. It probably happens, but certainly not all that frequently if so and it makes the film a lot more peaceful to watch. It definitely helps the characters as well. There’s no real animal violence here either although Chewy was a pretty bad character in this film for actually cooking an animal off screen. Considering what planet he is on, it came off as really insensitive. He’s not as bad as Groot, but he definitely had no real role in this story. Yoda’s cameo is a lot more satisfying with his fans and I’d say he looked good. Anyone who zaps something Luke’s a fan of is okay in my book and it was just a really great thing of him to do in general. If Yoda can look like this in the future, he may become more tolerable. One pattern you’ll quickly notice in this film is that the rebellious characters are the best ones. Poe defies orders to quickly take command and it’s a great scene. Rey impulsively decides to head for the main villain’s base against Luke’s command (ha!) and while the plan doesn’t go well at first, I can agree with the notion. She’s confident in her abilities and certainly wasted no time in arriving there. It’s amazing how quickly she got there honestly and I was glad to see someone was taking charge. It’s similar to when Luke defied Yoda to go save his friends. It’s always the right option and always a blast to see even if it rarely goes too well for the hero. I think the real issue that hurts this film a lot is the fact that it has virtually no replay value. It’s the kind of film that you really wouldn’t want to see twice because there isn’t really a reason to. There are a couple of big scenes where a character almost dies but doesn’t. I suppose it’s dramatic if you think they are going to die but since you would know better the 2nd time around it loses the impact. You could say the same for many films, but this one in particular really builds up the scene to the death as it drags on for a while to get maximum effect. Since you know these scenes are red herrings the next time, you’ll just want them to get on with it. It’s a really long film that feels like a long film. In the same way that some mysteries are hurt by watching them twice while others keep the replay value, this is just one of those action films that works best as a 1 time experience. It’s a natural consequence of upping the drama but maybe you can make an argument that the enhancement to the film the first time around is worth it. Not sure I’d argue that, but it’s there. 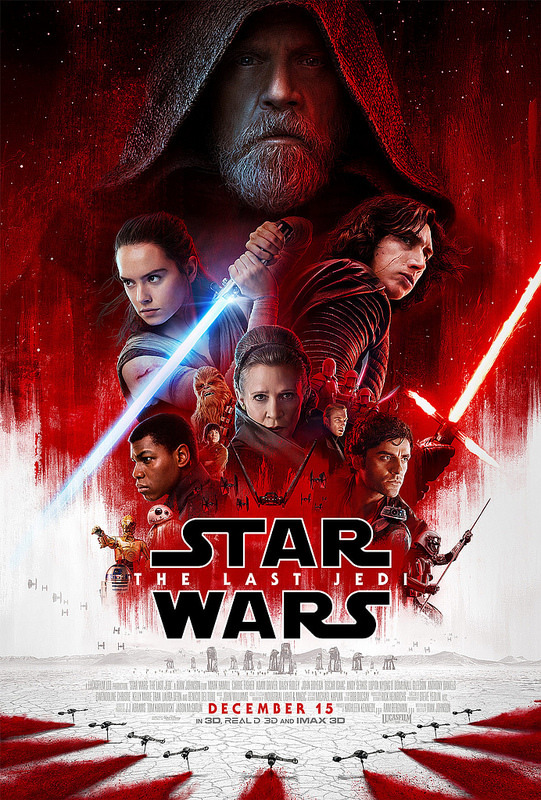 Overall, Star Wars: The Last Jedi is a good film. It’s hampered by its long run time and fairly weak cast, but still has enough strengths to carry it over the hill. Poe and Rey are two solid heroes and that’s enough to help keep the film going. The fight scene we get with Rey vs the Red Guards is pretty fun and hopefully we’ll get more action in the next film. Now that certain characters shouldn’t be appearing anymore, the cast should get a lot stronger for the next film. Since it is also the end of the trilogy I’m expecting a lot more action. We got 1 Lightsaber fight and maybe 2 space fights. I’d like to see us double that number in the sequel, especially the lightsaber fight. I want an extended Force battle where Rey has to use her full arsenal. Anyway, I’d recommend the film to any action fan but if you’re a Star Wars fan then it goes without saying that you need to watch this one. This entry was posted in Live Action Movie Reviews, Live Action Movies, Reviews and tagged Action, Blockbuster, Carrie Fisher, Disney, Film Review, George Lucas, Jedi, Mark Hamill, Movie Review, Review, Sci-Fi, Sith, Star Wars, Thriller by dreager1. Bookmark the permalink. The only Star Wars I’ve seen besides this was The Force Awakens, and while I liked that one, this was disappointing to me. A few good moments, but I didn’t like the whole Finn/Rose subplot in particular. I saw Coco right after, and I loved it so much better. Maybe once I see the other Star Wars, but for now, a let down for me. This Was By Far The Most Lackluster Star Wars Movie (Or Any New Movie For That Matter) I’ve Seen All Year. I Watched All Of The Interviews With Mark Hamill And I Thought To Myself “Don’t Watch This Movie.” His Heart Was Not In This Film At All. I’d Give It Maybe A 5 And Recommend It ONLY To A Fan Of Force Awakens, Not A Fan Of The Original 3 Movies. How Can It Improve? After This Movie, I’ve Lost Just About All Faith In The Next Star Wars Movies. A Few More Light Sabre Battles Wouldn’t Hurt I’ll Agree, But What Else Can Be Done?